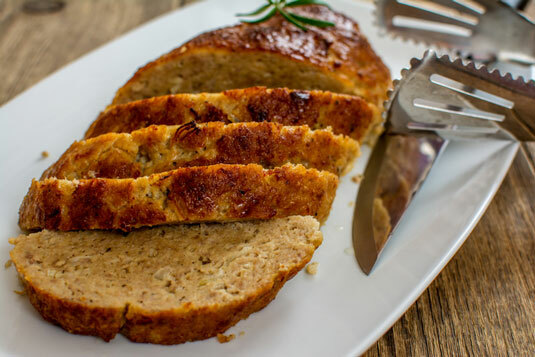 Meatloaf has been around for many years, but it’s still a welcome addition to anyone’s menu. This meatloaf recipe still has the beloved ketchup in it, but it’s topped with tomato gravy, too. Kids love to work with their hands, and making meatloaf is the perfect opportunity. After having your kids wash their hands, place all the ingredients for the meatloaf into a large bowl and let them mix away. This is a perfect way to introduce different ingredients to your kids, and since they helped, they’ll love to eat it. The leftovers make great sandwiches the next day. Preheat the oven to 350 degrees. Coat a 9-x-5-x-3-inch loaf pan with nonstick cooking spray. Heat the olive oil in a medium skillet. Sauté the onion and garlic until translucent but not brown, about 5 minutes. Add the thyme and pepper and sauté for 2 minutes. Remove pan from heat and allow to cool. Combine the ground beef, bran, ketchup, Worcestershire sauce, parsley, and egg whites in a bowl and mix well. Stir in the cooled onion mixture. Fill the loaf pan with the beef mixture. Bake the loaf approximately 1 hour 20 minutes, until the internal temperature of the meatloaf reaches 160 degrees. Top with Tomato Gravy. Heat the oil in a large sauté pan over medium-high heat. Add onion and sauté for 2 minutes. Add black pepper, tomato purée, parsley, and fresh thyme. Bring to a light simmer for 5 minutes, stirring occasionally. Per Serving: Calories 290 (From Fat 130); Fat 15g (Saturated 5g); Cholesterol 75mg; Sodium 210mg; Carbohydrate 16g (Dietary Fiber 5g); Protein 26g; Sugar 6g.